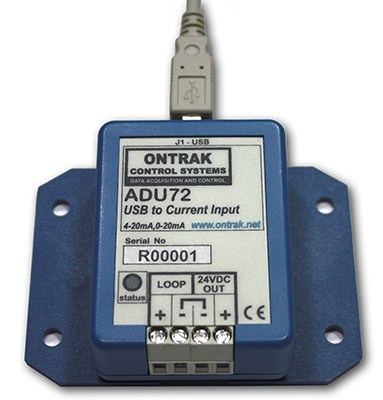 The ADU72 USB to Current Input interface enables measurement of 4-20mA and 0-20mA signals from standard process transmitters via a single USB connection. The ADU72 internally generated 24VDC loop supply eliminates the need for an external loop power supply. This low-cost USB to Current Input Interface is easy to use with VB, and Visual C++ or .NET via standard HID drivers included with Windows 98,2000,XP,7,8,10. A mini-driver ( DLL )* is also provided allowing control using standard ASCII commands using familiar readfile , writefile commands. The ADU72 includes a 10' USB cable and is available in a flange mount enclosure with a DIN rail mount option. 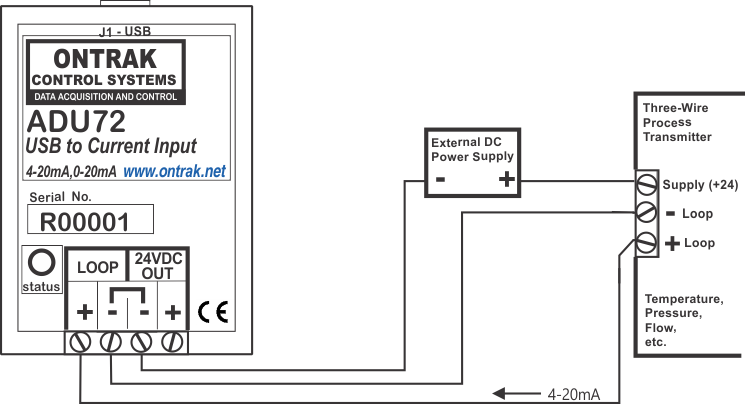 Connecting external devices to the ADU72 is relatively simple, however, caution must be taken when making connections to the internal 24VDC loop power supply. 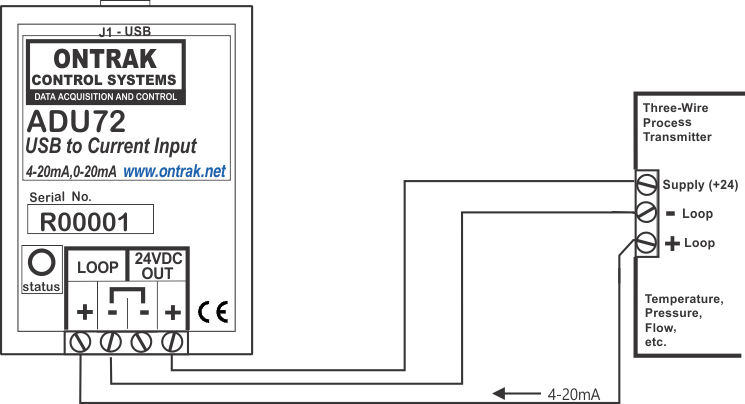 When using an external loop power supply, no connection should be made to the "+" of the ADU72 24VDC OUT terminals. 1. Connecting the ADU72 to 4-20mA Two-wire process transmitters. Figure 1 shows the connections required to interface to a two-wire process transmitter using the ADU72 internal 24V supply to power the loop. The two connections shown are all that is required. Figure1: ADU72 connections to a loop-powered, two-wire, process transmitter. If desired, an external loop power supply can be used with loop-powered process transmitters. Connections are as shown in Figure 2. 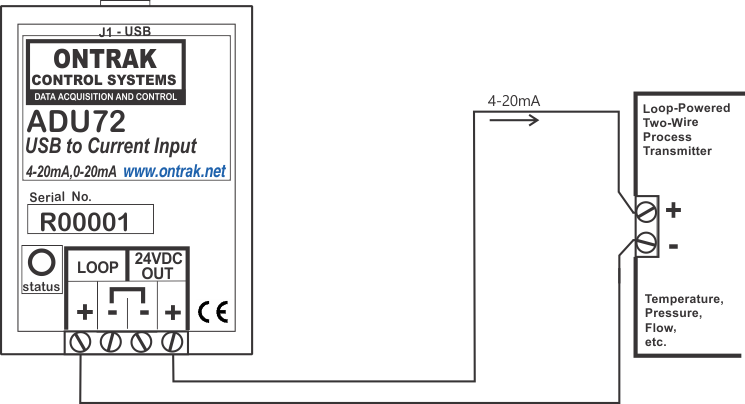 When using an external loop power supply, no connections should be made to either of the ADU72 24VDC OUT terminals. 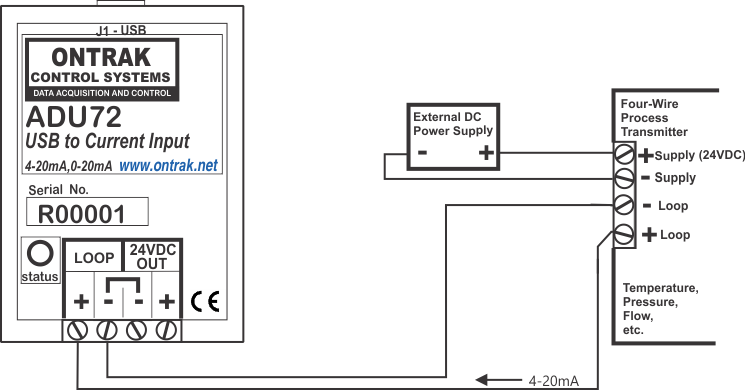 Figure 2: ADU72 connections a two-wire transmitter using an external loop power supply. 2. Connecting the ADU72 to 4-20mA Three-wire process transmitters. The ADU72 is capable of providing 24VDC at 35mA to power three wire process transmitters that operate on 35mA @ 24VDC or less. Figure 3 shows the proper connections for this configuration. CAUTION: Do not use this configuration if the three-wire process transmitter requires more than 35mA of supply current. Use external supply as shown in Figure 4. Figure 3 : ADU72 connections to a three-wire process tranmitter that operates on 35mA or less of supply current. Figure 4 illustrates the proper connections to a three-wire process transmitter using an external power supply. This configuration is required if the process transmitter requires more than 35mA of supply current. CAUTION: Make no connection to the ADU72 24VDC OUT "+" terminal in this configuration. 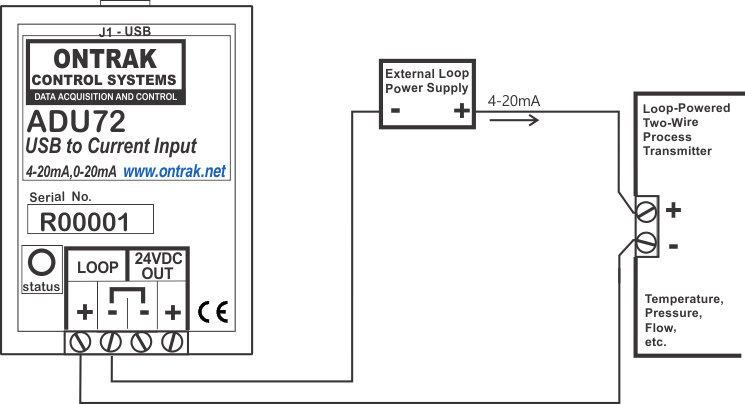 Figure 4 : ADU72 connections to a three-wire process tranmitter using an external loop power supply. 3. Connecting the ADU72 to 4-20mA Four-wire process transmitters. The ADU72 is capable of providing 24VDC at 35mA to power four- wire process transmitters that operate on 35mA @ 24VDC or less. Figure 5 shows the proper connections for this configuration. CAUTION: Do not use this configuration if the four-wire process transmitter requires more than 35mA of supply current. Use external supply as shown in Figure 6. 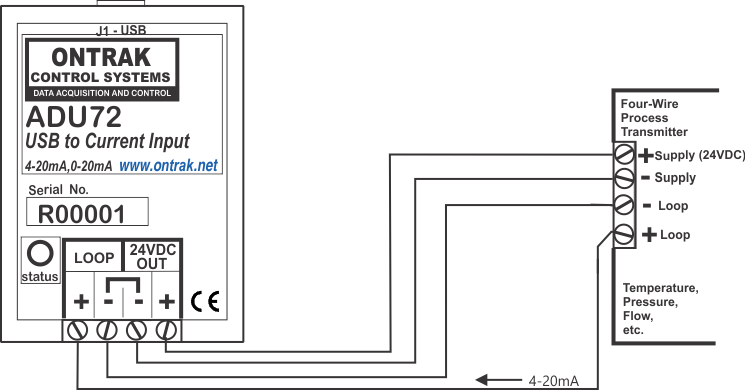 Figure 5 : ADU72 connections to a four-wire process tranmitter that operates on 35mA or less of supply current.. Figure 6 illustrates the proper connections to a four-wire process transmitter using an external power supply. This configuration is required if the process transmitter requires more than 35mA of supply current. CAUTION: Make no connection to the ADU72 24VDC OUT "+" terminal in this configuration. Figure 6 : ADU72 connections to a four-wire process tranmitter using an external power supply.